FAKE ICA WEBSITE STEALING SINGPASS ID!! INFORM FRIENDS AND FAMILY!! 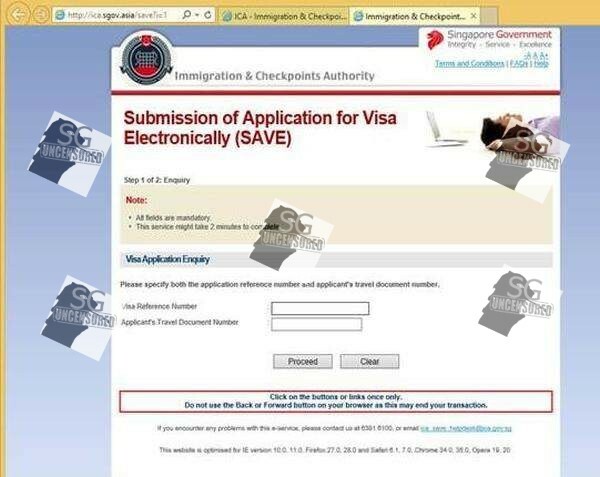 You are at:Home»Caught In The Act»FAKE ICA WEBSITE STEALING SINGPASS ID!! INFORM FRIENDS AND FAMILY!! It has come to our attention that there is a fake Immigration & Checkpoints Authority (ICA) website that is phishing for visitors’ visa application numbers and passport numbers – www.ica.sgov.asia. 2. The ICA would like to advise members of the public to exercise caution so that you do not unwittingly fall prey to such fake websites. Members of the public are also advised to use only the official ICA website at www.ica.gov.sg for all informational and transactional needs concerning ICA matters. 3. We would like to assure everyone that access to the official ICA website remains unaffected and no data has been compromised. ICA takes a serious view of such fake websites as they undermine public trust in our system and processes. A Police report has also been made. We will work to bring down the website and will continue to monitor them. Previous ArticleGerman Police Tell Singaporean To Prove That She Have Milk.